. They're not the standard black, blue, and orange of the common lady bug larva either. 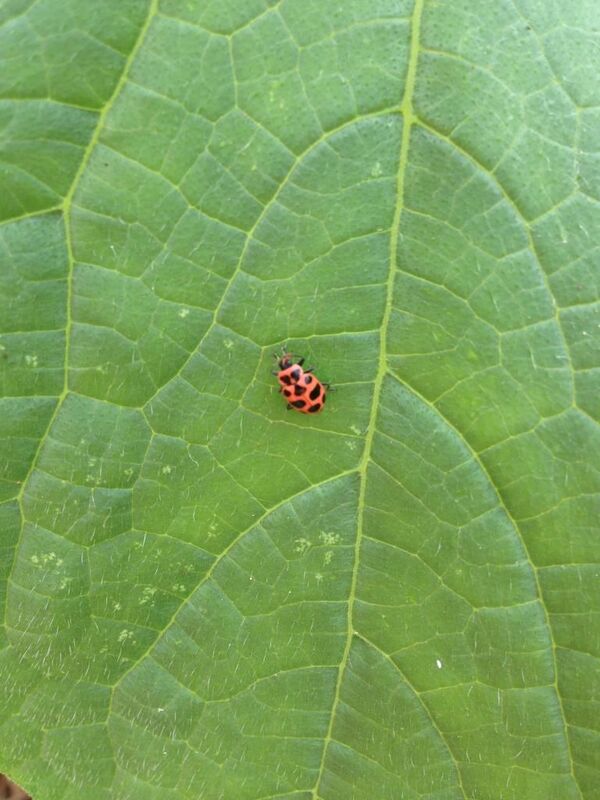 Re: Lady beetle or pink cucumber beetle? Isn't that it in the bottom right corner? I saw the Parenthesis the other day on the Hazel bush. Yeah that's it! 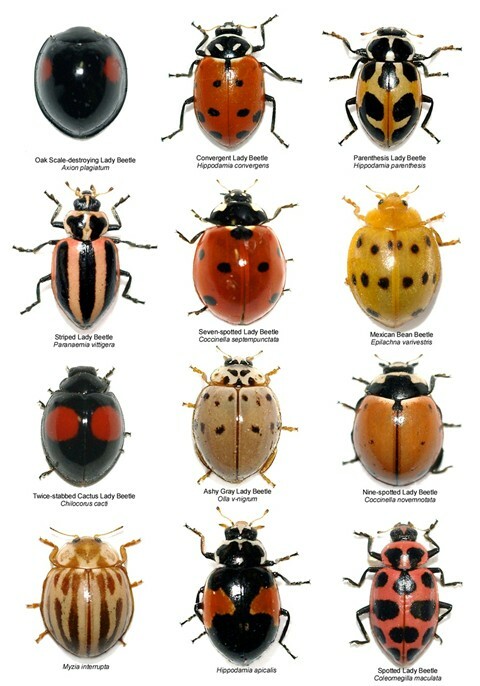 I see Mexican bean beetle on there, too. So I guess the next question is...Is it beneficial? Imma go do some researching. It's a beneficial!!!! I don't have any idea what it's eating! I sure don't SEE anything. I've only actually seen one cucumber beetle so far this year! 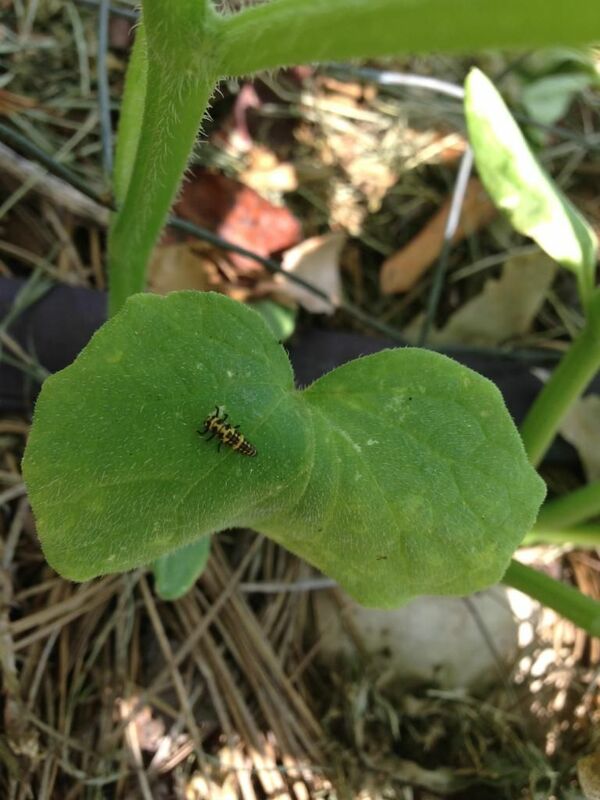 The one I DID see was being all chummy with this lady... Silly cuke beetle. ETA: I'm only seeing them on the cuke and pumpkin plants. Nothing else. ...except to collect as much hungry young Garden Patrol members as I need to transport them to their assigned stations. I feel like the lady bugs are doubling in appearance everyday! And their larvae! Noticed some teeny tiny maggots. I can't get a good shot of them, but I believe they're sucking the aphids. They start yellow, but if they're attached to the aphids they turn the same red. Never noticed them before. There a LOADS of them though. I'm seeing a whole lot of aphid "raisins" as well. I'm leaning towards the maggots, or larvae, or whatever they are. Can't find anything on google that I think matches very well. I'll never forget my first year gardening. Something (aphids) was steadily trying to terminate my cucumbers. Then I started seeing these "gross" bugs on them. AHA! Gotcha! Too bad I didn't look it up first - I killed about half of them before I did look it up and realized that they were ladybug larvae! This is SO awesome! Aphid Midge!!! I'm certain these are them! And there are literal 10-20 on each large leaf! I'm so glad I was patient!!! This is what is so glorious about chemical free gardening! !